The 1853 New York state election was held on November 8, 1853, to elect the Secretary of State, the State Comptroller, the Attorney General, the State Treasurer, the State Engineer, two Judges of the New York Court of Appeals, a Canal Commissioner, an Inspector of State Prisons and the Clerk of the Court of Appeals, as well as all members of the New York State Assembly and the New York State Senate. After the split of the Democratic Party in 1848 over the slavery question, a large part of the Barnburner faction, who had joined the Free Soil Party, returned to the Democratic Party and re-united with the Hunkers. During the following years, the Hunkers split over the question of reconciliation with the Barnburners. The Hards were against it, denying the Barnburners to gain influence in the Party. The Softs favored reconciliation with the intention of maintaining enough strength to win the elections. Both Hards and Softs favored a compromise on the slavery question: to maintain the status quo and to leave the decision to the local population in new Territories or States if they want slavery or not, as expressed in the Kansas–Nebraska Act. The Barnburners were against the permission of slavery in new Territories or States, but were now the minority in the party. The Whig state convention met on October 5 in Syracuse. Benjamin F. Bruce was Temporary Chairman until the choice of Ex-Governor Washington Hunt to preside over the convention. James M. Cook was nominated for Comptroller on the first ballot (vote: Cook 88, Spaulding 29, Josiah B. Williams 8). Elias W. Leavenworth was nominated for Secretary of State on the first ballot (vote: Leavenworth 82, Samuel J. Wilkin 41, Spaulding 3). Elbridge G. Spaulding was nominated for Treasurer on the first ballot (vote: Spaulding 82, Jeremiah Ellsworth 19, Epenetus Crosby 11, Myron H. Clark 10). Ogden Hoffman was nominated for Attorney General on the third ballot (first ballot: Daniel Ullmann 49, Hoffman 45, Roscoe Conkling 27, J. M. Van Cott 4, Thompson 3; second ballot: Hoffman 56, Ullmann 54, Conkling 16, blank 1; third ballot: Hoffman 74, Ullmann 48, Conkling 5, blank 1). Cornelius Gardinier was nominated for Canal Commissioner on the second ballot (first ballot: Gardinier 30, David S. Wright 28, Ebenezer Blakely 19, Samuel P. Russell 16, Thomas Clowes 13, Ogden N. Chapin 13; second ballot: Gardinier 75, Blakely 19, Wright 18, Russell 5, Clowes 3, Chapin 1, Peabody 1, blank 1). Thomas Kirkpatrick was nominated for Inspector of State Prisons on the third ballot (first ballot: Kirkpatrick 22, Henry Underwood 21, Josiah T. Everest 14, Norwood Bowne 13, Alexander H. Wells 9, A. F. Crocker 9, Henry Bradley 9, Abner Baker 7, Benjamin Squire 7, William Lyons 6, Epenetus Crosby 5, Joseph Garling House 5; second ballot: Kirkpatrick 55, Underwood 45, Bowne 17, Everest 11; third ballot: Kirkpatrick 70, Underwood 60). John T. Clark was nominated for State Engineer by acclamation. Benjamin F. Harwood was nominated for Clerk of the Court of Appeals on the first ballot (vote: Harwood 62, E. P. Cole 22, A. T. McCarty 10, J. T. Lamport 8, P. Smith 5, Robinson 2). George Wood was nominated for a full term as Judge of the Court of Appeals on the second vote (88 ayes, 20 noes) after William Rockwell had been rejected in the first vote. Joseph Mullin was nominated for the short term by acclamation. 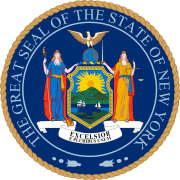 23 Whigs, 7 Hards and 2 Softs were elected to a two-year term (1854–55) in the New York State Senate. 78 Whigs, 24 Hards, 24 Softs and 2 Free Democrats were elected for the session of 1854 to the New York State Assembly. "The Campaign. Hard-shell Demonstration." New-York Daily Times. November 4, 1853. pp. 1, 8. ^ "The Democratic State Convention; The Softs and the Hards". New-York Daily Times. September 16, 1853. p. 3. ^ "The Whig State Convention". New-York Daily Times. October 6, 1853. p. 3. ^ To fill the vacancy caused by the resignation of Freeborn G. Jewett, a judge was elected for the remaining four years of the term. This page was last edited on 9 February 2019, at 18:22 (UTC).